This revised and refreshed third edition of Knitting For Dummies features new knitting patterns, refreshed and additional projects, a new bibliography and suppliers list, and improved step-by-step knitting instructions. Plus, from the book, you can access step-by-step instructional videos online that enable you to see and practice the knitting techniques found in the book. From casting on to knitting in the round—and more—this new edition provides refreshed content and new images and access to online videos to help you follow along with the text. The book's user-friendly online instructional videos empower you to get started knitting immediately. Experienced and novice knitters alike can benefit from the step-by-step instructions and informative videos included in this new edition of Knitting For Dummies! Pam Allen is a designer whose knitting patterns have appeared in such publications as Interweave Knits and Twist Collective. 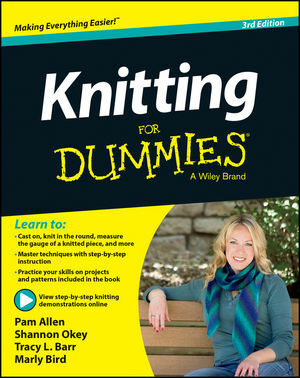 Shannon Okey, knitting author and blogger, can be found at knitgrrl.com. Tracy L. Barr is a professional writer and editor. Marlaina "Marly" Bird, a knitting instructor and Creative Director at Bijou Basin Ranch, teaches at national wool festivals and expos as well as online at Craftsy.com.